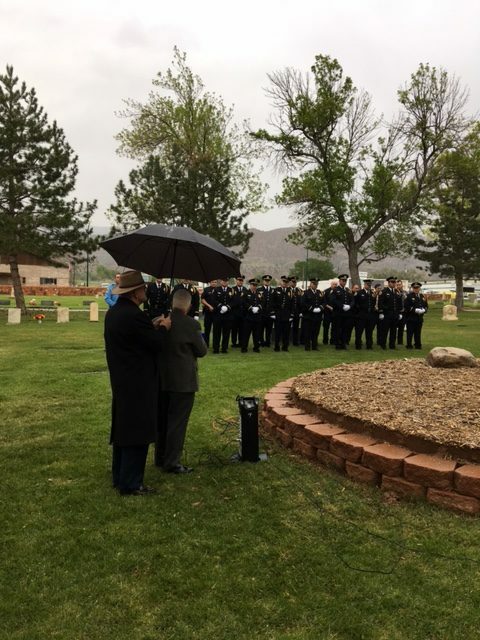 CEDAR CITY – The dark skies and ominous storm clouds overhead with scattered rain showers set the somber setting Wednesday morning as Cedar City police officers gathered at the cemetery to remember their fallen comrades. 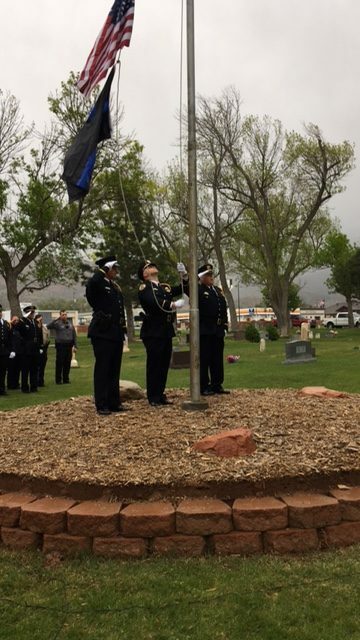 The ceremony hosted by Cedar City Police Department was one of many held this week throughout the country in honor of National Police Week. The service was a tribute to the 118 officers who died in the line of duty and 66 others who were victims of malicious attacks in 2016. 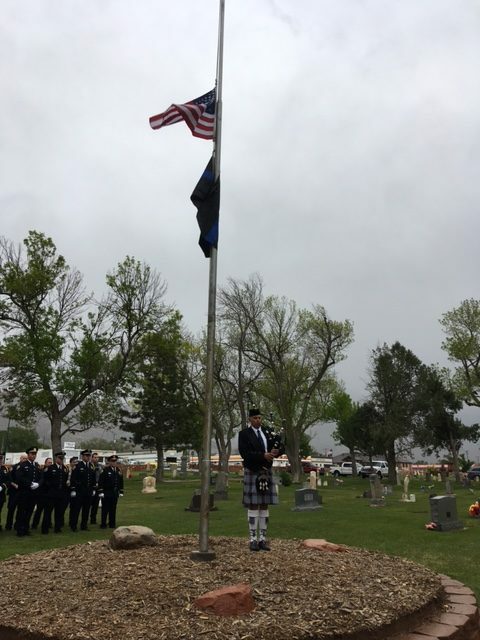 About 35 to 40 people attended Wednesday’s memorial that included some remarks from Shakespearean Founder Fred Adams, bagpipe music and the lowering of the American flag to half-staff. The service is one that Sgt. Jerry Womack said the department plans to continue as an annual event to remember those officers who gave their all. President Trump kicked off this week’s events by signing an executive order Monday proclaiming May 15, 2017, as Peace Officers Memorial Day and May 14 through May 20, 2017, as National Police Week. “Police officers are the thin blue line whose sacrifices protect and serve us every day, and we pledge to support them as they risk their lives to safeguard ours,” the proclamation states. The president also spoke at the annual National Peace Officers’ Memorial Service that drew in approximately 30,000 to 40,000 attendees to the Nation’s Capital. Trump ended the day by lighting up the White House in blue – the first time a president has ever done this during Police Week. The move was in keeping with his campaign promise to be a strong supporter of law enforcement and return “law and order” to the country. Knowing the president has their back goes a long way to helping law enforcement feel safer and in turn carrying out the duties of their job, Cedar City Police Chief Darin Adams said. “Just to hear the support coming from the president as he spoke from the White House lawn was gratifying and really helps to boost and enhance morale and confidence,” Adams said. The number of U.S. police officers killed in the line of duty hit a five-year high last year with more ambush-style attacks than in the past two decades, according to FBI statistics. Many officers point to the negative attitudes from previous administrations that they feel were perpetuated by the national media to the public as part of the reason for the increase in numbers. 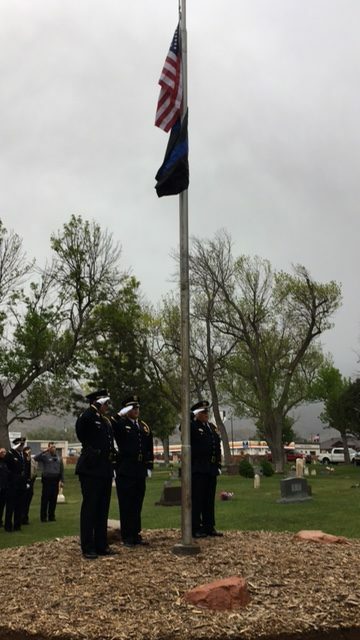 Despite the current climate of dislike toward law enforcement, officers throughout Iron County have continued to enjoy local support, something they say they heavily rely on in their job. Womack and Gower echoed Adams’ sentiments stating they were also grateful for the community support, recognizing the importance of the public in their role as police officers. Trump also called on Americans to support law enforcement. “To all Americans watching this event today, next time you see a cop on the beat, take a moment to say two wonderful words, which they so readily deserve: Thank you. Thank you,” Trump said to a round of applause. President John F. Kennedy first signed a similar proclamation in 1962 honoring those who gave all. 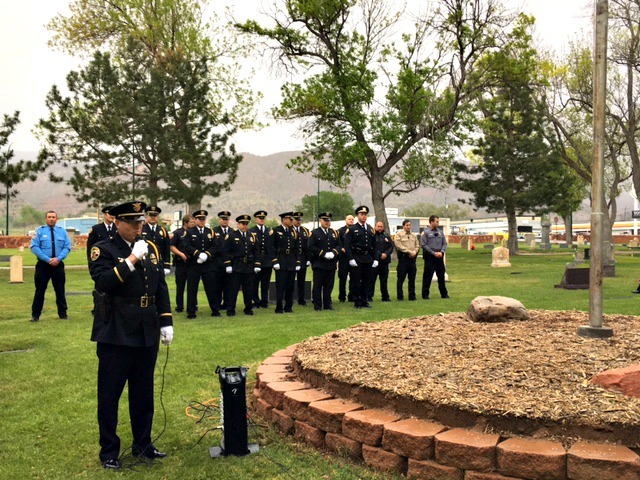 The Memorial Service formally began 20 years later in 1982 as a gathering in Senate Park with approximately 120 survivors and supporters of law enforcement. 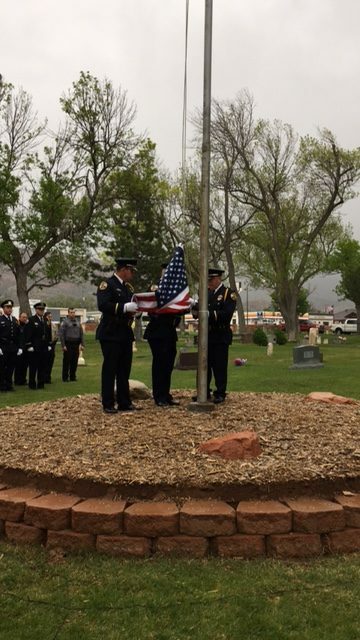 Every president since has observed Peace Officers Memorial Day with flags flown at half-staff and proclamations honoring the service and sacrifice of law enforcement officers throughout the nation.